In this post I am going to analyse Scottie’s stationary conformation. (I think I’ll do his movement in another post.) I am the first one to say that Scottie’s conformation isn’t great and he is at risk of developing problems. However, for those of you who read my last post about conformation, you will know that conformation isn’t the only thing I look for in a horse. On the photo, the two blue lines represent the top line and the under line. Ideally the top line should be half the length of the underline. As you can see, both the blue lines are very similar in length, showing that Scottie has a long back. So why is having a long back a problem? Long backs, although they tend to have more flexion, the back also tends to be weaker. Both of these things basically related to a higher risk of injury. The longer length of bone is often associated with a higher risk of tendon injury. The fine cannon bones are also prone to more serious injuries than a thicker leg. A ewe neck is a problem as it means it is a lot harder for the horse to work round. 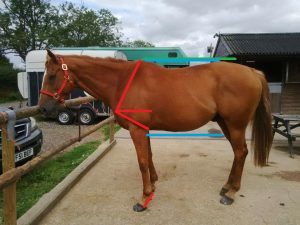 A horse with a ewe neck usually has very little topline, thick muscle along the bottom of the neck and a dip in the neck in front of the withers. However, a ewe neck can be improved and sometimes completely fixed with correct training and muscle build up. Scottie has a closed shoulder angle (less than a right angle). This isn’t a huge problem for us at all. It usually just means he has a smaller range of movement through the shoulder. Other than these things, Scottie’s conformation is okay as he is fairly balanced. He has a long neck, but he has a long body to balance it out. He has a big front end, but his hind end is building to balance it out. And despite some of the problems with his conformation, he has nice paces, is starting to work round and never had any problems with lameness while racing, so in theory shouldn’t have a problem with what I want to do with him.